Being up to Date: Status Quo and Trends of Treatment For those involved in the identification and management of patients with inborn errors of metabolism, this book is now recognised as the standard textbook in this interdisciplinary field. It has proved to be indispensable for professionals in specialities ranging from pediatrics, neonatology, pathological biochemistry and genetics to neurology, internal medicine, nursing, dietetics and psychology. This 5th edition has been extensively revised and updated. What's new - Additional chapter focusing on inborn errors affecting adults, particularly the late neurological presentations - Numerous updates on diagnostic procedures and treatment - Newly discovered disorders. 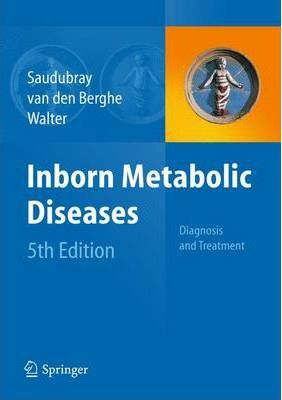 As with previous editions, the book opens with a section presenting the clinical approach to inborn metabolic diseases for those cases in which a diagnosis is being sought. This now includes a chapter on the clinical presentation of metabolic diseases in the older age range, using an analogous structure. If a particular diagnosis is already suspected, the reader may refer to the following sections of the book containing general chapters on diagnostic procedures and treatment, and on specific groups of disorders. As with earlier editions, the chapters have been written by authors who are internationally recognised experts on their subjects. They provide information in a clear, relevant and concise manner using a coherent structure. Part I: Diagnosis and Treatment: General Principles: Classification and clinical Approach to Inherited Metabolic Diseases in Pediatrics.- Clinical approach to Inherited Metabolic Diseases in Adulthood.- Newborn Screening for Inborn Errors of Metabolism.- Diagnostic Procedures and Postmortem Protocol.- Emergency Treatments.- Part II: Disorders of Carbohydrate Metabolism: Glycogen-Storage Diseases and Related Disorders.- Disorders of Galactose Metabolism.- Disorders of the Pentose Phosphate Pathway.- Disorders of Fructose Metabolism.- Persistent Hyperinsulinemic Hypoglycemia.- Disorders of Glucose Transport.- Part III: Disorders of Mitochondrial Energy Metabolism: Disorders of Pyruvate Metabolism and the Tricarboxylic Acid Cycle.- Disorders of Mitochondrial Fatty Acid Oxidation and Related Metabolic Pathways.- Disorders of Ketogenesis and Ketolysis.- Defects of the Respiratory Chain.- Creatine Deficiency Syndromes.- Part IV: Disorders of Amino Acid Metabolism and Transport: Hyperphenylalaninaemias.- Disorders of Tyrosine Metabolism.- Branched-Chain Organic Acidurias/Acidemias.- Disorders of the Urea Cycle and Related Enzymes.- Disorders of Sulfur Amino Acid Metabolism.- Disorders of Ornithine Metabolism.- Cerebral Organic Acid Disorders and other Disorders of Lysine Catabolism.- Nonketotic Hyperglycinemia (Glycine Encephalopathy).- Disorders of Proline and Serine Metabolism.- Transport Defects of Amino Acids at the Cell Membrane.- Part V : Vitamin-Responsive Disorders: Biotin-Responsive Multiple Carboxylase Deficiency.- Disorders of Cobalamin and Folate Transport and Metabolism.- Part VI: Neurotransmitter and Small Peptide Disorders: Disorders of Neurotransmission.- Disorders in the Metabolism of Glutathione and Imidazole Dipeptides.- Trimethylaminuria and Dimethylglycine Dehydrogenase Deficiency.- Part VII: Disorders of Lipid and Bile Acid Metabolism: Dyslipidemias.- Disorders of Cholesterol Synthesis.- Disorders of Bile Acid Synthesis.- Part VIII: Disorders of Nucleic Acid and Heme Metabolism: Disorders of Purine and Pyrimidine Metabolism.- Disorders of Heme Biosynthesis.- Part IX: Disorders of Metal Transport: Disorders in the Transport of Copper, Zinc and Magnesium.- Part X: Organelle-Related Disorders: Lysosomes, Peroxysomes, and Golgi and Pre-Golgi Systems: Disorders of Sphingolipid Metabolism and Ceroid lipofuscinosis.- Pompe Disease, Mucopolysaccharidoses, and Oligosacharidoses.- Peroxisomal Disorders.- Congenital Disorders of Glycosylation.- Cystinosis.